Plastic's fantastic in law enforcement circles. Our expert shooters wring out and compare four top contenders. Throughout history, technological advances in firearms were just as likely to be greeted with derision as with enthusiasm. Fans of the matchlock musket distrusted the flintlock, while a few dozen decades later partisans of muzzleloading scoffed at the new concept of metallic cartridges. Later everyone believed that repeating firearms were too complicated and likely to get out of order in the field. And those smallbore, jacketed bullets could not possibly stop a determined enemy soldier like a heavy, slow-moving lead projectile. Or how about police using semiauto pistols instead of revolvers? The very idea was too ridiculous to contemplate. Where it all began: The first of the truly successful polymer pistols was the revolutionary Glock 17. The so-called Third Generation pistol includes a finger-groove grip, accessory rail, extended magazine release and slide-stop lever. Well, as history has proven, the above examples were not the first time the traditionalists among us were wrong, and they won't be the last. The last two decades of the 20th century saw radical changes on the U.S. handgunning scene, the two most momentous being American law enforcement agencies switching en masse from the revolver to the self-loading pistol and the introduction of pistols that used frames, and other parts, made from polymer. While traditionalists were guardedly pessimistic about the first, they went absolutely ballistic over the second. Plastic pistols for cops? Based on an average of three five-shot groups fired from a rest at 50 feet. Velocities are an average of five rounds chronographed 15 feet from the muzzle. r out, degrade, melt or dissolve and scoffed at the notion that plastic could be as tough as steel. Despite these dire predictions and downright hatred directed toward them, polymer-frame pistols quickly became the hottest items on the police handgun market. Heckler & Koch's newest entry in the plastic pistol market is the P2000. Visible here are the ambidextrous slide stop and magazine-release levers. (Inset) The P2000 comes with four interchangeable grip inserts to adapt the pistol to a variety of hand sizes. And for good reason. Modern polymers provide equal, if not superior, resistance to wear, abrasion, solvents, oils and environmental extremes as steel and alloy-frame pistols. The frames can be molded into a variety of ergonomic shapes that do not require separate grip panels, permitting them to use high-capacity magazines without increasing the bulk of the grip, making them adaptable to persons with smaller hands. They are lighter than steel or alloy, which is a big plus when you have to lug one around for eight or 10 hours a day, and they have the added advantage of flexing under recoil, absorbing some of the recoil pulse so they shoot softer than heavier handguns. The newest entry in the plastic pistol market is S&W's Military & Police. It has ambidextrous slide-stop levers, while the magazine catch can be switched from port to starboard. (Inset) The M&P has three different-size palm swells so the shooter can adapt the pistol to his hand size. According to recent studies, it is estimated that more than 60 percent of American police officers now carry some sort of polymer-frame pistol. It didn't take civilian shooters long to recognize that the same features that made polymer pistols so practical for police service made them equally adaptable as home-defense, concealed carry, trail and competition handguns. Today almost every handgun maker of note offers a pistol with a polymer frame. So the question arises, Which plastic pistol is the best? Springfield's XD has ambidextrous magazine-release catches and an external grip safety. Its ergonomic grip provides excellent control and natural pointability. While there are many polymer-frame pistols that I could have included in this comparison test, I decided to limit myself to four of the brands that are most popular with American law enforcement agencies and thus acquired a Glock 17, Springfield XD, H&K P2000 and Smith & Wesson M&P. I went through great pains to ensure that no test pistol had any technological advantages over the competition. All four utilize a variation of the double-action-only trigger system: Glock's Safe Action, Springfield's USA, Smith & Wesson's New Age and H&K's LEM. The S&W and H&K both feature interchangeable grip inserts so the shooter can adapt it to his particular hand size. All four of the polymer pistols had rails for mounting tactical lights or laser sights. Our quartet of handguns all feature high-tech metal finishes, Picatinny rails for mounting tactical lights or laser sights, fixed sights and accept post-Clinton high-capacity magazines. The H&K stood out in the pack because it uses an external hammer to ignite cartridges, while the other three were striker fired. Springfield's XD was notable as the only one with an external safety device and grip safety, and while the M&P's magazine releases can be switched from port to starboard, the XD and H&K were ambidextrous. The M&P and H&K had ambidextrous slide releases, while all four had some means of providing visual and/or tactile indication when their chamber was loaded. The Glock was unique in that it was the only one that used polymer (albeit metal-lined) magazines rather than stainless steel. To further level the playing field--and because it's my favorite pistol cartridge--all of our test guns were chambered for the 9mm Parabellum cartridge. Jeff Hoffman at Black Hills provided us with a sufficient quantity of ammunition, loaded with 115-grain FMJ bullets. For the sake of comparison, the group of shooters fired an all-steel Para-Ordnance 18.9 LDA during the test of the four polymer-framed pistols. It was obvious that our four polymer pistols have more in common than not, so it was going to be very interesting to see how they compared in our test. To do so I contacted my good friends Larry Mefford, Jim Tosco and Kim and Dave Nichols, who--along with your humble author--are avid competitive shooters who shoot in a number of USPSA and steel matches each month. After discussing the matter for a while, we decided to run the four pistols through a series of Action Pistol stages that would emphasize handling qualities, accuracy, rapid-fire capabilities, ease of reloading and reliability. I suggested that it would be interesting to fire the same stages with an all-steel pistol to see if it provided any advantages (or disadvantages) over our plastic quartet. The Para-Ordnance 18.9 LDA was chosen. This stainless steel, 9mm pistol uses Para's Light Double Action trigger system and accepts high-capacity magazines, which puts it in the same ballpark, tactically speaking, as our four contestants. The author and his companions each ran all five pistols through a UPSA-type field course and then set up an El Presidente drill and did the same thing over again, and again, and again. Seen here is the author showing them how it is done with the M&P. they choked up, we would clear the malfunction and, if possible, keep on shooting. Black Hawk Industries provided us with versions of the CQC SERPA holster and magazine pouches for all of our test pistols. The day before we met at the range, I checked each pistol for zero and accuracy and then set up my PACT chronograph to see what type of performance I was getting out of them. The results can be seen in the accompanying chart. We had designed a field course that combined USPSA cardboard targets (kindly provided by Dave Zimmerman of the Target Barn), which were partially obscured by no-shoots or range props, and various types of steel targets. The shooter had to engage targets from various ranges, from multiple positions, shooting around barricades with mandatory movement. As the magazine capacities of our test guns varied, we decided to use USPSA Production Pistol rules, which meant that magazines were loaded with no more than 10 rounds. This would, once again, level the playing field in addition to giving us a good idea of how easy they were to reload under pressure. All of the pistols provided accuracy well within the range of acceptance for service arms. The Smith & Wesson M&P had the best group average. 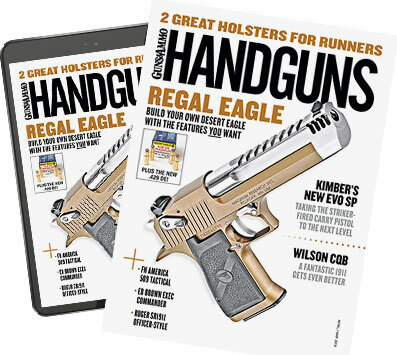 We then set up one of the most famous and challenging Action Pistols stages, the El Presidente, and proceeded to run all five of our test pistols through it, over and over. A few observations are called for. Regarding ergonomics, the newer designs had an edge over the Glock, which has not really received an update in this area in many years. Since all five of us shoot competitively with single-action pistols, I found it a bit surprising that when it came to trigger control, the three pistols with the longest strokes beat out those with the shorter ones. The accuracy category was, for all practical purposes, a toss up, with all five pistols providing more than sufficient accuracy for police/defensive purposes or informal competition. Ease of reloading was another toss up, except in the case of the H&K. All of us are accustomed to pushing magazine-release buttons inward, and under the pressures of speed shooting we repeatedly forgot that the release on the P2000 moves in a downward direction. The following weekend, Kim Larry, Jim and I met at the range again on a rather damp, foggy morning and spent several hours launching lots of 9mm projectiles in the direction of the club's steel-plate racks. The drill was simple: The shooters began with a pistol, loaded with 10 rounds of ammo, holstered. On the signal, they drew and engaged the six steel plates. Once they were all (hopefully) down, they reloaded and reholstered the pistol and repeated the whole process three more times. Scoring was the total time for four racks of plates with that particular pistol plus a one-second penalty for any plates left up. While in theory this meant the shooter could dispose of four racks of plates with all five pistols with a minimum of 120 rounds of ammunition, we expended a bit more than that. But then, that was the whole purpose of this exercise. Seeing no reason whatsoever to haul unnecessary gear home, I gestured toward the pistols and ammunition laid out on the table and told my friends, "Y'all have fun." They proceeded to do just that, with gusto. It should be mentioned that before we began shooting plates, our test pistols were already dirty, but by the time we were done that day all of them were downright encrusted. ch pistol. Despite that, we experienced only one malfunction--a failure to feed with the Para LDA--and that was traced to a defective magazine. I found this to be a very positive statement as to the level of quality control exercised by the pistols' respective manufacturers.